Organic mercury (Hg) is a global pollutant of concern and selenium is believed to afford protection against mercury risk though few approaches exist to rapidly assess both chemicals in biological samples. Here, micro-scale and rapid methods to detect organic mercury (< 1.5 ml total sample volume, < 1.5 hour) and total selenium (Se; < 3.0 ml total volume, < 3 hour) from a range of biological samples (10-50 mg) are described. 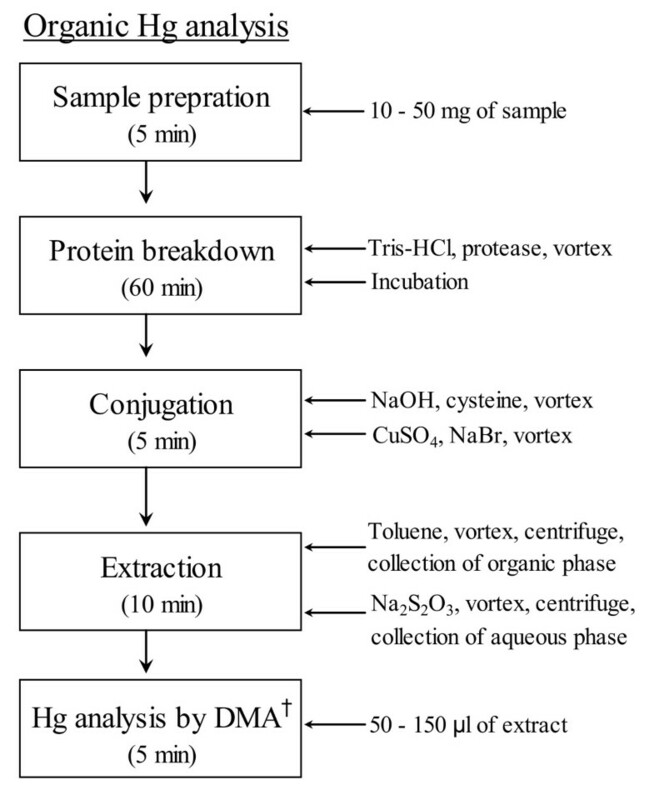 For organic Hg, samples are digested using Tris-HCl buffer (with sequential additions of protease, NaOH, cysteine, CuSO4, acidic NaBr) followed by extraction with toluene and Na2S2O3. The final product is analyzed via commercially available direct/total mercury analyzers. For Se, a fluorometric assay has been developed for microplate readers that involves digestion (HNO3-HClO4 and HCl), conjugation (2,3-diaminonaphthalene), and cyclohexane extraction. Recovery of organic Hg (86-107%) and Se (85-121%) were determined through use of Standard Reference Materials and lemon shark kidney tissues. The approaches outlined provide an easy, rapid, reproducible, and cost-effective platform for monitoring organic Hg and total Se in biological samples. Owing to the importance of organic Hg and Se in the pathophysiology of Hg, integration of such methods into established research monitoring efforts (that largely focus on screening total Hg only) will help increase understanding of Hg's true risks. Mercury (Hg) is a ubiquitous heavy metal that is neurotoxic to humans and wildlife. It is ranked as a top three priority pollutant by the U.S. EPA's CERCLA program. In the U.S., more than 50% of water bodies are under fish consumption advisories largely due to Hg contamination. In addition, Hg levels in the tissues of most fish-eating wildlife are within 10-fold of levels known to cause overt damage[4, 5]. Mercury's fate and toxicity depends upon its chemical speciation. In particular, organic Hg (generally found as methyl Hg, MeHg) is of health concern since it penetrates lipid bilayers, biomagnifies through aquatic food chains, and about 95% of the ingested dose is absorbed into the blood stream. Methyl Hg can also cross the blood brain barrier by conjugating with L-cysteine and exploiting the methionine-uptake pathway. As Hg has a high affinity for protein thiols, multiple neural components are vulnerable to its toxic action. In an effort to assess Hg concentrations in biological samples, various analytical schemes are used[8–10]. Mercury strongly absorbs light at 253.7 nm and total Hg can be quantified via established spectroscopic methods. Recently, commercial vendors (e.g., Milestone Inc., BrooksRand, Perkin Elmer) have provided direct mercury analyzers to the market which permit rapid and straightforward analysis of total Hg. However, the detection of organic Hg is still hindered by sample treatments steps that are time consuming, wet chemistry digestions that generate ample chemical waste, and/or need for complex instrumentation. One common method to assess organic Hg involves pretreatment of sample with acid followed by alkaline digestion, and then extraction with an organic solvent (benzene or toluene) and finally back-extraction into an aqueous solution using cysteine or thiosulphate[4, 10–12]. Organic Hg compounds may be quantified on the basis of separation techniques (e.g., GC, HPLC) with a sensitive detector (e.g., ECD, CV-AAS, ICP-MS). Selenium (Se) is an essential micronutrient. It is postulated that the presence of Se within cells may mitigate Hg toxicity by forming an inert crystalline Hg-Se complex[13, 14]. Further, strict Hg-Se molar ratios of 1:1 have been observed in biological tissues from several organisms, though few Hg monitoring studies co-report on Se levels. The essential role of Se in physiology has encouraged the development of analytical methods for its quantification at trace levels. Among available techniques, fluorescence-based methods are considered to be easier and more cost-effective than conventional spectroscopic techniques (e.g., ICP-MS, GFAAS or HGAAS) though few have outlined in detail key methodological considerations for the assessment of total Se in biological samples[17–19]. Owing to the need to determine both organic Hg and total Se in biological samples, there is a need to develop and apply of fast and reliable analytical methods. Here we detail a series of methods that may be used to simply and rapidly detect organic Hg (< 1.5 ml total sample volume, < 1.5 hour) and total Se (< 3.0 ml total volume, < 3 hour) in a range of biological samples. Figure 1 provides a graphical schematic of the procedure to extract and detect organic Hg. About 10 to 50 mg of Standard Reference Materials (DOLT-3: dogfish liver, TORT-2: lobster hepatopancreas; both from the National Research Council of Canada, NIST 1566b: oyster tissue from National Institute of Standards and Technology, USA) was homogenized in 50 mM Tris-HCl buffer (pH 8.5) containing protease (Subtilisin A, 99%; 100 μg), and next incubated at 50°C for 1 hr. Following this digestion step, NaOH (40%; 125 μL), cysteine (1%; 50 μL), CuSO4 (0.5 M; 50 μL), acidic NaBr (3.1%; 500 μL), and toluene (500 μL) were sequentially added to the digest and vortexed. Following centrifugation at 13,000 g for 5 minutes at room temperature, the top toluene layer was transferred to a test tube and mixed twice (60-80% of toluene) with Na2S2O3 (5 mM; 150 μL) to permit back-extraction of organic Hg into an aqueous phase. The aqueous phase was re-centrifuged (13,000 g for 2 minutes) and then placed into another test tube (1.5 mL tube) for organic Hg analysis. The final extracts, once obtained, can be analyzed for Hg content within a few days. All samples (SRMs for total Hg, extracts for organic Hg) were directly analyzed by a DMA-80 (DMA-80 Milestone, Inc., Shelton, Connecticut, USA) as we have previously outlined elsewhere[20, 21]. Briefly, the direct mercury analyzer liberates mercury by introducing samples into a controlled heated environment. Nickel and quartz boats are used to introduce solid and liquid samples, respectively, into the machine's autosampler. The autosampler delivers the sampling boats into a quartz catalytic tube, where it is dried and then thermally decomposed in a continuous flow of ultra pure oxygen. Combustion products are carried off and further decomposed in a hot catalyst bed. The remaining decomposition products are carried by oxygen to a gold amalgamator that selectively traps mercury vapour. After the system is flushed with oxygen to remove any remaining decomposition products, the amalgamator is rapidly heated to release the mercury vapour from the gold trap. Then, flowing oxygen carries the mercury vapour through absorbance cells positioned in the light path of a single wavelength atomic absorption spectrophotometer. Absorbance is measured at 253.7 nm as a function of mercury concentration. This method is endorsed by the U.S. Environmental Protection Agency (EPA Method 7473). Here, the detection limit for the direct Hg analyzer was 0.020 ng and ranged from 0.010 to 0.029 ng. Total and organic Hg concentrations are expressed as μg/g (ppm) dry weight. Schematic procedure of organic mercury analysis ( † Direct Mercury Analyzer; Time estimates are based on the analysis of one sample, though several can be batch processed). A simplified microplate-based fluorometric assay (total volume < 3 ml) for biological samples has been developed, based on the tube-based method of Sheehan and Gao developed for urine and plasma. 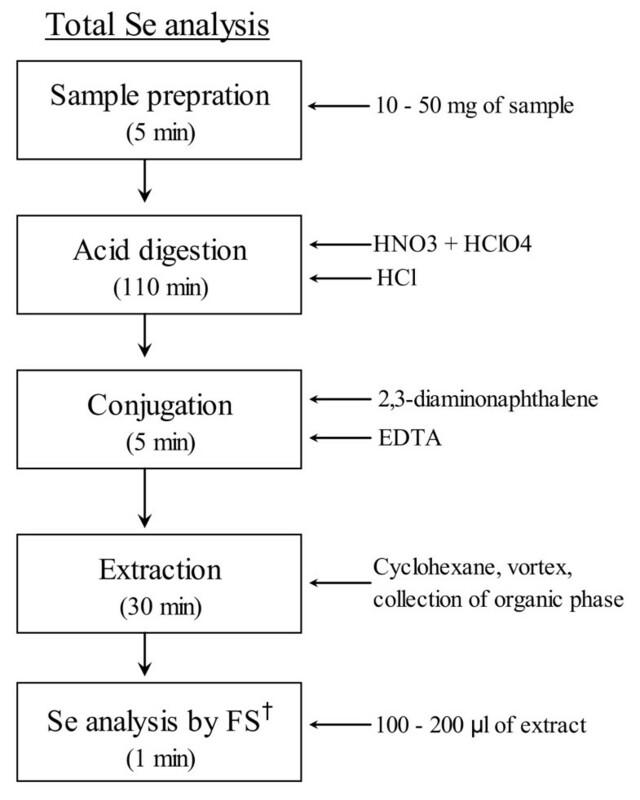 The method involves sample digestion (HNO3-HClO4 and HCl), conjugation as a piazselenol (2,3-diaminonaphthalene, DAN), and cyclohexane extraction (Figure 2). Approximately 10 to 50 mg of SRMs (DOLT-3, TORT-2, NIST 1568a: rice flour, NIST 1577b: bovine liver, NIST 1515: apple leaves, selenite and selenate stock standard solution) and lemon shark (Negaprion brevirostris) samples were digested in the presence of 400 μL of HNO3(70%) and 100 μL HClO4(40%) for 80 min at 195°C, followed by the addition of 500 μL of HCl for 30 min at 150°C in a borosilicate tube. These acid digestions facilitate the oxidation of all forms of Se (particularly selenide and selenate) into selenite (selenous acid). To the digest, 10 mM of EDTA with sequential additions of 6.3 mM of DAN in 0.1 M HCl (500 μL) and 1 mL of cyclohexane was added to form a fluorescent complex as a 4,7-dichloro-5,6-benzopiazselenol (Cl2-Se-DAN complex) in an organic phase. Though endogenous metals present in working solutions may interfere with DAN, the interference may be masked by the addition of 10 mM of EDTA, which we tested here (250 μL; tested ranged from 1 to 100 mM). The fluorophore extracts, which reflect total Se, can be determined by fluorescence spectroscopy (emission at 560 nm; excitation at 360 nm) using 96 well microplates. Samples should be measured within a few hours of extraction. Concentrations of total Se in shark kidney samples obtained by the fluorometric assay were compared to values obtained using a conventional graphite furnace atomic absorption spectroscopy method as previously described. The detection limit of total Se for the fluorometric assay ranged from 2 to 3 ng, with standard curve linearity for total Se concentrations up to 600 ng (Figure 3). Schematic procedure of total selenium analysis ( † Fluorescence Spectrometry; Time estimates are based on the analysis of one sample, though several can be batch processed). 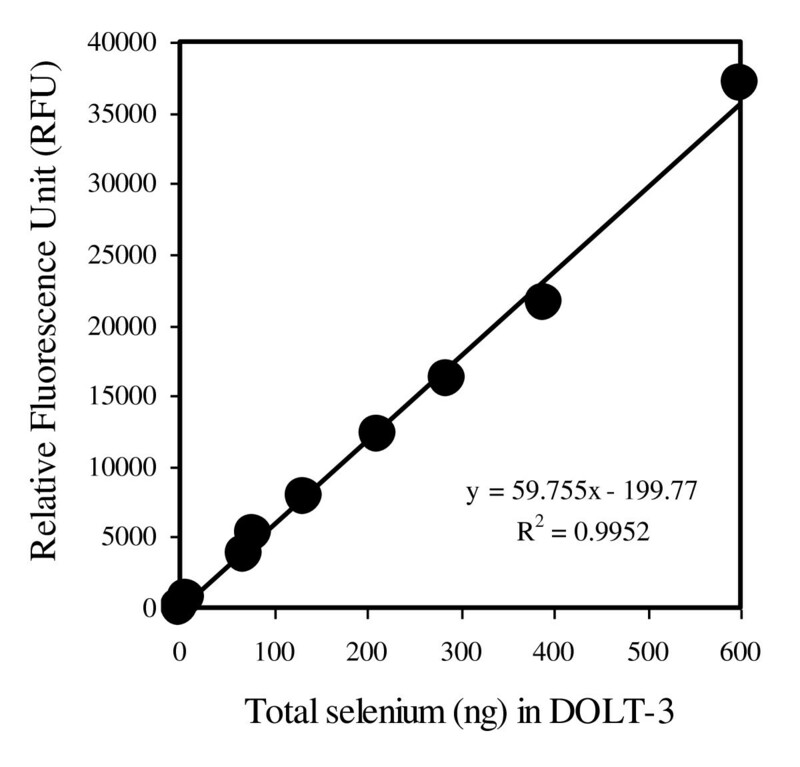 Relationship between predicted and measured total Se (ng) values in DOLT-3 using the fluorescence method described here. Average recovery rates from the certified values of DOLT-3, TORT-2, and NIST 1566b for total Hg were 98.9 ± 4.3% (n = 61), 97.5 ± 5.5% (n = 23), and 95.4 ± 4.9% (n = 3), respectively (Table 1). For organic Hg, the average recovery rates from the certified values of DOLT-3, TORT-2, and NIST 1566b were 98.6 ± 5.7% (n = 47), 97.9 ± 4.7% (n = 19), and 97.2 ± 9.6% (n = 4), respectively (Table 1). For total Hg and organic Hg, the relative standard deviation (RSD) was lower than 10% for all replicate measures. These results confirm the accuracy and precision of this method. The recoveries are similar to values published previously[4, 20, 21]. For total Se (Table 2), the recovery rates were within the certified values (± 18%) for DOLT-3 (n = 35; 103 ± 18%), TORT-2 (n = 20; 99.2 ± 15.7%), NIST 1568a (n = 8; 102 ± 16%), and NIST 1577b (n = 8; 97.3 ± 11.7%). Total Se was not detected from apple leaves (NIST 1515; 0.050 μg/g) which is likely due to the low concentration (close to detection limits) of Se in this material. Selenite (which is converted from all forms of Se) reacts with DAN to yield a fluorescent Se-DAN complex. 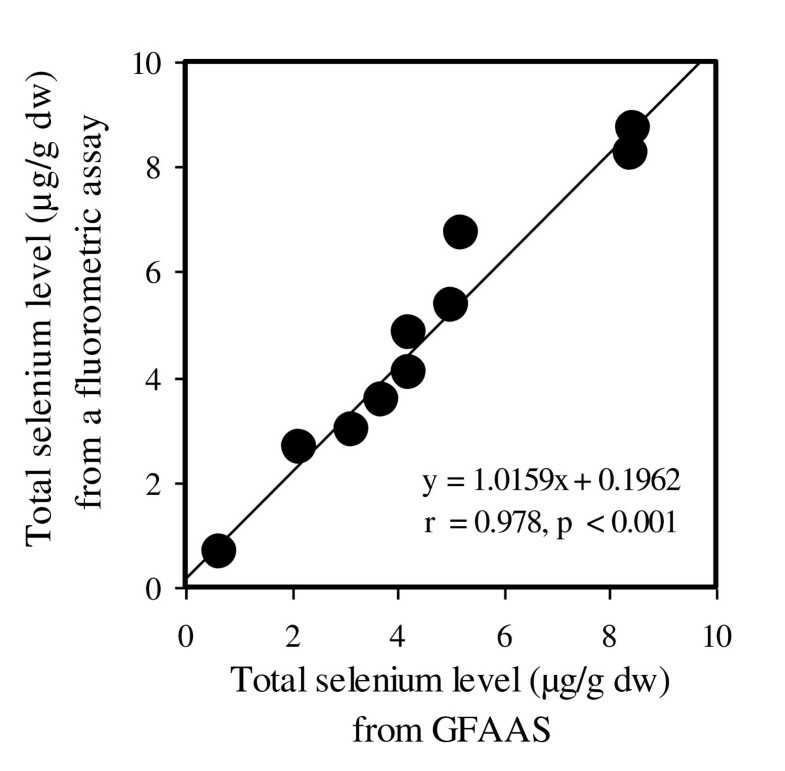 The recovery rates of selenate standard stock solution (even at higher levels such as 100 or 250 μg/g) were similar to those from the selenite solution (Table 2). This indicates that the outline methodology is efficient at converting all selenate into selenite. In addition, Se concentrations in shark kidney samples (n = 10) that were measured using the fluorometric method described here were comparable to those observed obtained using graphite furnace atomic absorption spectroscopy (GFAAS) method (r = 0.978; p < 0.001) (Figure 4). Results of the current assay may provide a rapid and reliable analytical approach for measuring total Se, although the fluorophore stability results remained to be resolved. Pearson correlations of total Se in lemon shark kidneys measured between fluorometric assay and atomic absorption spectroscopy (GFAAS). Overall, the outlined approaches provide an easy, rapid (< 1.5 hr for organic Hg, < 5 min for total Hg, < 3 hr for total Se), reproducible, and cost-effective platform for measuring organic Hg and total Se. As the methods are down-scaled, they require very small quantities of sample (10-50 mg) and can be performed on precious materials, and they generate less chemical waste than conventional approaches. This work was funded by the University of Michigan School of Public Health. We thank Doug Adams (Florida Fish & Wildlife Conservation Commission) for lemon shark tissues. DN and NB designed the study, analyzed data, and drafted the manuscript. Both have read and approved the final manuscript.